Thattekkad Bird Sanctuary, the first bird sanctuary in Kerala details are given here. Thattekkad bird sanctuary spreads over a region of about 25 km², situated about 12 km from Kothamangalam and has a rich and varied birdlife. Being the first bird sanctuary in Kerala, it was established in the year 1983. Several species of birds, both forest birds as well as the water birds, visit the sanctuaries every year. Read this article to know more about Thattekkad bird sanctuary. Being near the gateway to Western Ghats, Thattekkad host one of the best diversity for a bird sanctuary. Thattekkad bird sanctuary is one of the pioneer bird sanctuary in Kerala. It is situated near kothamangalam one of the most strategic location in Kerala. Thattekkad bird sanctuary is a hotspot for different types birds including both wild and water birds. It is located near Bhoothathankettu, a sought after tourist hub of our state. It is also close to Edamalayar, an evergreen dense forest. This strategic location of Thattekkad, being surrounded by such a wide variety of diversity helps it to be the most important bird sanctuary of our state. Thattekkad bird sanctuary spreads over a region of about 25 km², situated about 12 km from Kothamangalam and has a rich and varied bird life. Being the first bird sanctuary in Kerala, it was established in the year 1983. Several species of birds, both forest birds as well as the water birds, visit the sanctuaries every year. It also has a wide variety of flora and fauna that is a gem to the stunning environment already existing in Thattekkad. Salim Ali one of the world renowned ornithologist once regarded Thattekkad as the richest bird habitat on peninsular India. 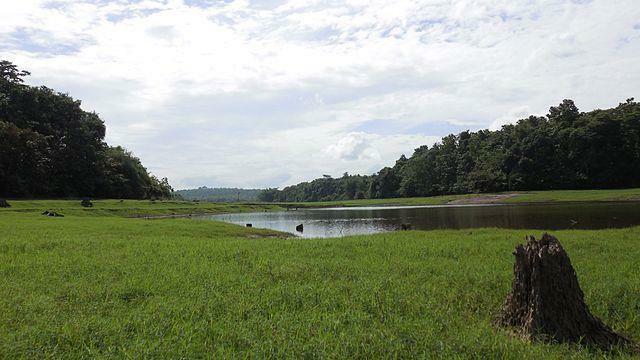 Thattekkad literally means flat forest, as the region is an evergreen low-land forest which is located between the branches of Periyar River , which is the longest river in Kerala this also provides a great spot for such a sanctuary. Thattekkad bird sanctuary host a ground for hundreds of migratory birds from round the globe, which take shelter hear during there journey. The scenic beauty of the place is incomparable. The mere sight of the place fills us with happiness. It belongs to the species of geokichla citrina. The orange- headed thrush is a bird in thrush. It is most commonly found in Indian sub-continent and south Asia. It belons to the species of phylloscopus magnirostris. It is a leaf warbler formerly include in the "Old World Warbler" assemblage. It belongs to the species of caprimulgus atripennis. It is found in southern region India and some parts of Srilanka. It is a night jar species. Its distinctive call is the most recognisable. It is a sub species of long tailed night jar. It belongs to the cuculiformers. They are mainly found in Indian sub-continent and southeast asia. It is very solitary and shy bird. They are mainly found in forest and open wood land at upto 3600m. Oriental darter is like all other anhingas, a coromorant like species known for its long neck. The structure of the neck is as in other species of alarter with strongly developed muscle about a kink in the neck at eighth and nienth vertebre that allows it to be flexed and darted forward with rapid force to stab fish underwater. Forty different species of cormorants and shags constitute to form the family of cormorants. There is no major difference between cormorants and shags. In earlier days it was common name old two species belonging to same family which were found in Great Britain. They are medium to large seabirds. They eat mainly small eels, fishes, and many a times small water snakes too. It is a seabird that belongs to tern family sternidae. This bird has enormous varieties based on its geographical races, differing mainly in size and minor plumage details. They prefer to breed in colonies on an land marshes, sometimes amongst black headed gulls, which provide some protection. Resident breeders in South Asia from northern Pakistan, northern India, south China, collared scops are magnificent creatures which breeds in well wooded and dense places. Collared scops are part of large grouping of owls known as typical owls, strigidae, which inculcate a wide range of species of owl. Ceylon Frogmouth aslo known as Srilankan Frogmouth, is a small creature that dwells in Western Ghats of southern India and is found in forest habitat. It has a distinctive call that is usually heard at dawn or dusk. Frogmouth is seldom seen during the day time except at roost or when flushed. Pompadour green pigeon is mainly found in forested regions of southern Asia. Theses pigeon are usually small in size ranging from 25 to 28 cm in length with a green or yellowish head and a green body. Theses beautiful creatures are many a times mistaken for parrots. Yellow browed bulbul belongs to the species of bulbul. Theses are found mainly in southern India and Srilanka. They have olive coloured head and and an yellow body. Yellow browed bulbul are easy to locate because of there loud calls. Theses birds are found in pairs or small groups and are very silent in nature. There eggs are pale pink or white with reddish brown in colour. Thattekkad, a place were beauty crowns nature is set amidst one of the greatest bio diversified zone in our state. Being there and spending time over there is like parting heaven with God. Countless tourist from round the globe visit this paradise every year. This is a hot spot for world renowned ornithologists who come hear to study about birds and their habitat. There are also people who come here in search of peace and solace by meditating. Here in thattekkad there are lot of tourist homes for people who want to stay there for few days. One among such place is the Hornbill camp. Located at the banks of periyar river, hornbill camp host the perfect dwelling place for those who have thirst for adventure. It has cottage tents built on a raised platforms. Hornbill camp is made in total harmony with the environment. The eco adventure lodge provides adventure travel experience. It is Kerala's first in camping a small touch of luxury. This camp provides birding,kayakina cycling and many other adventurous endeavours. The staff in the camp are all from the local villages and the camp meets all its requirements from the nearby villages. This camp provides a siurce f income for many. Apart from this there are many lodges, motels and PWD guest homes in Thattekkad. Idukki Wildlife Division, Vellappara, Painavu P.O. Njayapilli P.O., Kothamanagalam (via), Kerala.